Drop by someone’s house, and you’ll be hard-pressed to find anyone lounging in the living room or eating in the dining room. Where is everyone? Probably in the kitchen. As the new focal point of our homes and our lives, the kitchen has moved beyond a basic room for food storage and cooking to a centre of dining, relaxing, entertaining and even working. Because it’s been transformed from scullery to social hub, the kitchen has become a bigger energy hog. That makes it the perfect candidate for energy-efficient lighting, whether it’s a brand new kitchen, a down-to-the-studs remodel, or a low-budget facelift. So, how do you create a lighting plan for your kitchen that’s energy efficient, but also stylish and inviting? 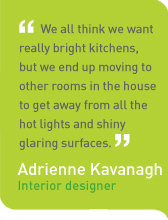 Here are a few tips from Adrienne Kavanagh, principal of Vancouver-based AK Interiors. According to designer Kavanagh, you should start by reducing the number of lights in the room and relocating light to the right areas. 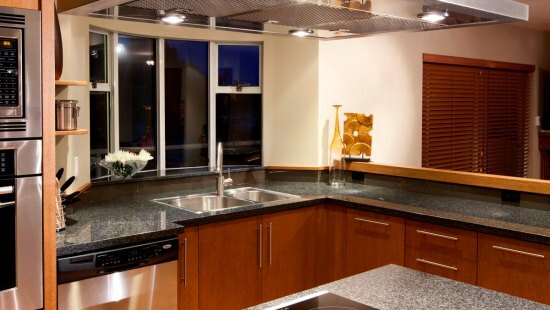 Instead of flooding a kitchen in light, Kavanagh advises making lighting more subtle and functional. Start with your ceiling light. In a new kitchen or major reno, Kavanagh recommends installing ENERGY STAR® recessed potlights for an uncluttered look that doesn’t compete with sparkling cabinetry, countertops and backsplashes. But don’t go overboard. Some designers add extra potlights to highlight a kitchen’s traffic paths. If you already have old potlights in the ceiling, Kavanagh advocates buying an ENERGY STAR CFL or LED retrofit kit to update your kitchen and lower your energy bills. Kavanagh recommends replacing other types of outdated kitchen lights — such as old fluorescent tube lighting that buzzes and flickers — with flush-mounted fixtures, which cast a more subtle glow, or track lighting, which can be positioned to shine light on different areas. If you can’t afford to replace the fixture just yet, swap old bulbs with ENERGY STAR CFLs or LEDs. Even old fluorescent fixtures can be made more energy efficient by adding new tubes. Next, think about how to make your kitchen’s light more functional. Kavanagh is a big fan of under-cabinet lighting for illuminating tasks such as food prep. If you’re installing new cabinetry, recessed lighting can be built into the bottom of cabinets. The upside? No visible wires or plugs. But even if you’re sticking to your existing cabinets, portable under-cabinet lighting has become easier than ever to install. “There are so many energy-efficient options available now that have a great look, like new fluorescent strip lighting and LED puck lights, says Kavanagh. If you have an island, Kavanagh suggests adding one or two pendant lights above it to illuminate your slicing and dicing. But, like potlights, too many can be a bad thing. If you want to save even more energy, consider that the colour of your kitchen’s walls, cabinets, countertops and backsplashes can impact lighting efficiency. “The lighter your paint and finishes are, the more light is reflected around the room, and the less work your lights have to do,” explains Kavanagh. Whether you want to add drama with darker shades or decide to keep your decor light and bright, it’s critical to develop a plan for how you’ll control your lights. It makes sense to carefully plan a lighting scheme for your kitchen — one that’s as energy saving as it is stylish and inviting — after all, it’s where we end up spending most of our time.